It's like a "dollar" van with less than one-tenth the amount of riders. Ford’s Chariot van service — which has been hyped as a key addition to the urban transit network, but is little more than $4 bus rides along set routes in areas already well served by existing service — is proving to be a big, expensive failure. Chariot’s chariots are mostly empty most of the time, according to data provided by the company and crunched by transit analyst Eric Goldwyn. Even on its best-performing weeks, Chariot’s fleet of 25 or so vans only serves around 1,000 riders total, or about nine riders per vehicle per day. The overall average is much lower — just five riders per vehicle per day. The service has routes, including a Greenpoint-DUMBO run and a Williamsburg-Midtown route. The ridership pales in comparison to the “dollar” vans that travel up and down Flatbush Avenue and other under-served parts of the city. On an average day, a single dollar van will carry between 125 and 150 trips, said Goldwyn, who studied the vans as a doctoral student at Columbia University last year. 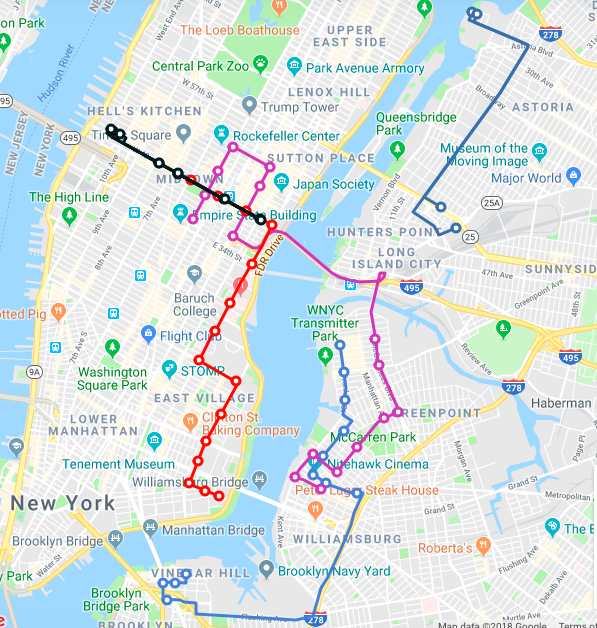 The Chariot data supports real-life experience: In May, TransitCenter’s Joelle Ballam-Schwan tested the service for a seminal blog post. On her first trip, Ballam-Schwan rode alone from Greenpoint to the Financial District. The second trip fared a bit better — she was joined by one other passenger. Despite the numbers, a spokesperson for Chariot said the company has “been pleased with the ridership … to date.” The company is now focused on building “enterprise” routes for private businesses and organizations, the spokesperson said, referring Streetsblog to a blog post articulating as much. Two of these routes are already operating for residents of luxury buildings in New York: One, along 42nd Street, serves the Oskar high-rise at 42nd Street and 11th Avenue. The second carries residents of the Durst Organization’s Hallets Point high-rises in Astoria to subway connections in Long Island City. A map of Chariot’s coverage area in New York City. It is unclear what Ford is doing with Chariot, which it bought for $65 million in 2016, based partly on its wider appeal in San Francisco. In New York, Chariot appeared to be positioning itself as a transit alternative during next year’s L train shutdown. But the shift to serving luxury apartment residents in transit deserts suggests the company has given up on its commuter-based approach. Chariot’s souped-up dollar vans are being billed as “micro-transit.” Given the negligible ridership in New York City, the moniker fits. Even though, Chariot deserves to fail, it remains to be addressed how “Dollar Vans” themselves aren’t actually regulated, right? We have this info on Chariot since they submit their data to TLC. Dollar Vans, don’t, right? If Dollar Vans were subject to TLC scrutiny, then I could get this driver ticketed for their outrageously unsafe driving. I rarely ever ride on Flatbush Ave. and this type of driving is why I’ll probably avoid it in the future, despite it, often being, the quickest and most direct route for me. The traffic on Flatbush moves really slowly most of the day, which, usually makes it safe for riding. There’s the problem right there. The model was to cannibalize public transit, which is subsidized. Rather than serve areas without public transit. They should have been thinking in terms of picking people up and taking them to commuter rail stations for $2.00, competing with the cost of a “station car” plus parking. Or taking people FROM commuter rail stations to suburban office parks, those that still have workers in them. Oy, dollar vans. They are a menace to everyone in the street, with their unmaintained deathtrap vehicles piloted by reckless and frequently unlicenced drivers. What’s more, they siphon revenue from legitimate forms of transit, as they depress ridership numbers that could otherwise justify service increases or the creation of new bus lines. The City should quit accommodating these dirtbags, and should aggressively shut them down. Anyone with half a brain could have told you this was destined to fail. Most public transit riders aren’t exactly rich. They’re not going to pay $4 for what they can now get for $2.75 or less. And if they’re transferring to the subway paying $4 for a van makes even less sense as the bus ride is essentially “free”. In fact, I recall that there used to be cars which picked up people at the Forest Hills IND station and ran down Jewel Avenue bus route, charging the same fare as the bus. They even accepted tokens as payment. This is at the time my area was a double fare zone. The cars did a thriving business, especially late nights, because bus service was often poor. The user didn’t pay any more money than they otherwise would have. These car services all but disappeared when the Metrocard and free subway-bus transfers arrived. Few people in their right mind would want to pay an additional fare just to save (at most) 10 or 15 minutes. Same thing here with the Chariot service. Those who drive dollar vans are probably about as well off as those who use dollar vans, and there isn’t some tech bro corporation to take more off the customer. That isn’t the case for the buses. Most of those who work for the MTA are far better off than most of those who use the MTA, if the value of retirement benefits is included. The PR for micro transit is outrunning empirical experience. It is clearly not the large-scale substitute for bus service that much media coverage makes it out to be. Even the best "micro transit" services look a lot like traditional dial-a-ride. Given the tens of billions of dollars that L.A. will spend on transit over the next few decades, it's all the more important to invest it in ways that will be useful and attract riders. Transit Service Shrinking? Get Ready for the Rise of the Dollar Van. With more American cities raising impressive sums to expand transit, the question of how to invest effectively is increasingly essential. So far, few places have hit on a policy combination that makes transit more useful to more people. To help cities "get transit right," Streetsblog is launching a new series about which transit strategies are working and which are not.